​On this page, a wide range of useful sources of teaching materials are provided. The numerous information sources that are accessible via the pages described below include many that are highly suitable for use by secondary school teachers. Please click here for information regarding the European DNA Day Essay Contest. The Virtual Genetics Education Centre (VGEC) provides many topic summaries and lists of linked teaching resources. Resources can be selected by age-range (e.g 11-14, 14-16 & 16-18). This is a large educational website that includes multiple educational 3D animations on DNA replication, gene expression, NGS, sequence data interpretation, gene editing & ethical issues. The NIH National Human Genome Research Institute's Education Section contains many resources that are suitable for secondary school education including materials on transcriptome, translation, PCR, cloning, DNA sequencing and GWAS. 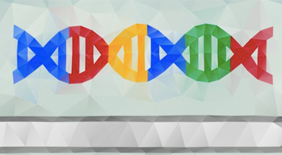 An impressively long list of links to genetics educational resources. A varied collection that includes videos and is displayed largely alphabetically. A set of videos, in different languages, explaining various types of chromosome abnormalities (may need to scroll down the YouTube page to reach the videos). Links to a variety of downloadable classroom materials, relating to genetics, including online museum information and debates. This website includes professionally recorded videos of older children with rare conditions, with accompanying downloadable factsheets and classroom activities. It includes resources for KS3 and KS4 (ages approximately 11-16). A large collection of resource links, especially for high school teachers (e.g. "Teacher Guide - Cloning", "Personalized Medicine" and "Beanbag Population Genetics"). Alphabetical list, categorised by topic: e.g. DNA Forensics, Epigenetics, Genetic Conditions & Heredity.